Cowboy Ribeye Steak with Chimichurri Sauce is something to behold. It’s really hard to know where to even begin to explain just how delicious these steaks and this sauce is. But…does this give you an idea? Just look at that steak and chimichurri sauce. Now, if this doesn’t get you excited, then watch us show you how easy it is to make the best steak in town, with some amazing fresh Best Chimichurri Sauce, too. Sit back and get ready to salivate as we make this incredible Grilled Cowboy Ribeye Steaks with Chimichurri Sauce! A good ribeye steak is about as good as they come in our book. 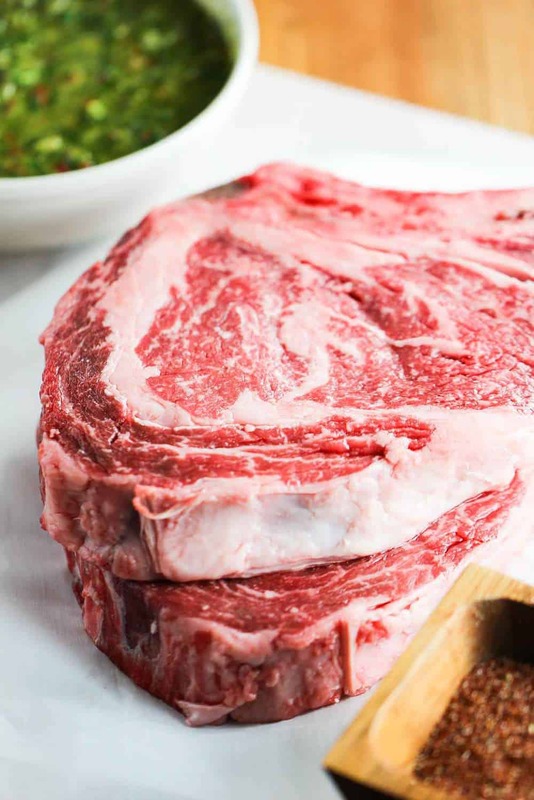 They are well marbled cuts of meat, which means as they cook, that marbling begins to melt and becomes so tender and juicy with every bite. Seek about a nice 1-inch to 1 & 1/2-inch thick ribeye (bone-in) from your local meat market or butcher. Curious as to what makes the ribeye one of the juiciest and most flavorful cuts of meats available? 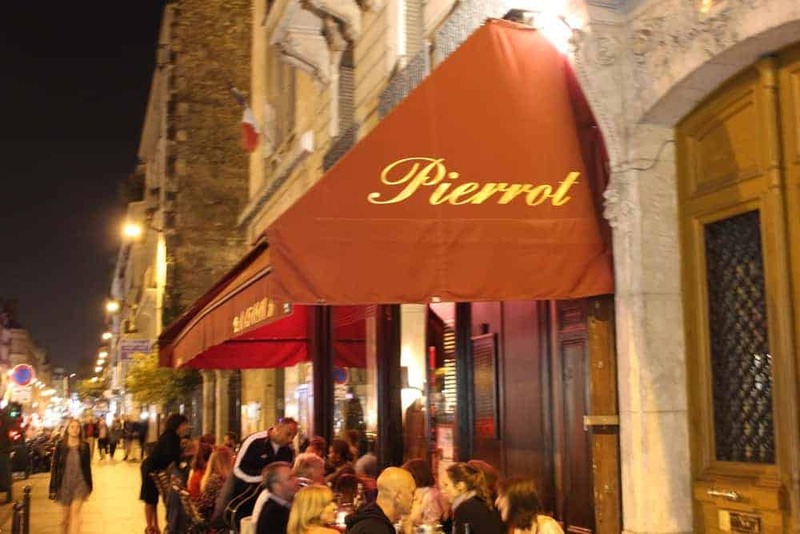 Read this interesting article About the Ribeye Steak to learn more. Well, let me tell you, my ancho chili rub that gets applied to this steak before it hits the hot grill is what bring out that amazing “Yee Haw” moment when you take your first bite. This is rub is the real deal. Then on to the grill this Cowboy Ribeye Steak goes. The smell is immediate. The sizzle. The juicy anticipation is not easy. That’s when you quickly make the incredible Best Chimichurri Sauce. 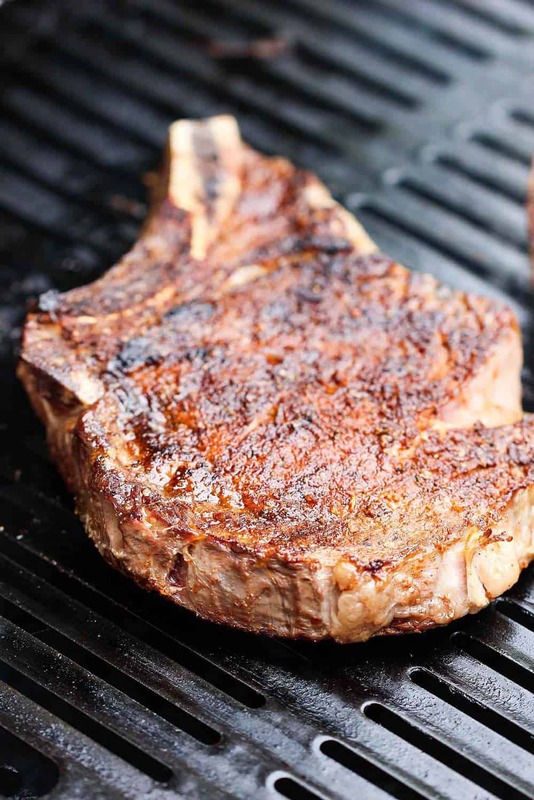 As soon as the steaks hit the hot grill, the rub begins to caramelize and form a bit of a crust, which perfectly seals in the most juicy of juicy steaks. We’re not kidding around with this Grilled Cowboy Steaks with Chimichurri Sauce. And you serve these to a hungry group of cowboys and cowgirls, be prepared for lots of whooping and hollering. All this incredible Cowboy Ribeye Steak needs at this point is a spoonful of the incredible Best Chimichurri Sauce. The steak and the chimichurri sauce are a perfect match for each other. Y’all…that’s a heck of a steak. 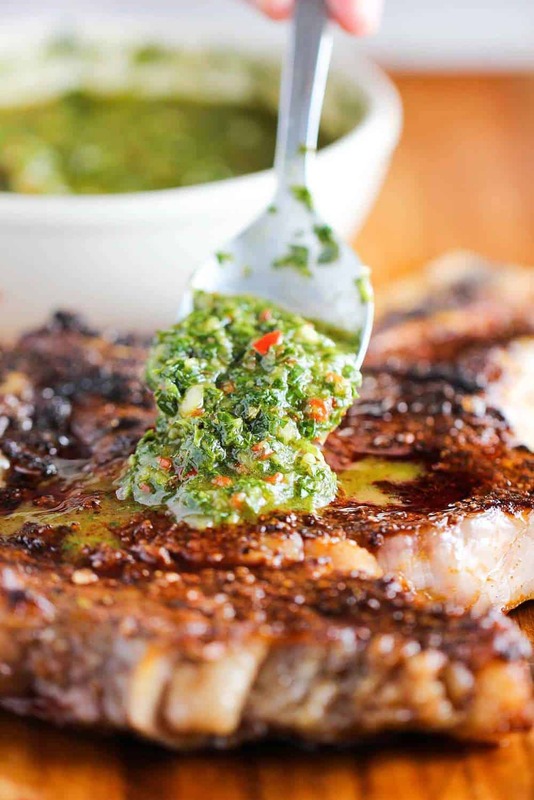 This Grilled Cowboy Ribeye Steak with Chimichurri Sauce is about as good as it comes. The ancho rub brings the steaks to life, and the sauce is vibrant and compliments the steak perfectly. Let steaks sit at room temp for 1 hour. Make the Best Chimichurri Sauce and set aside. Mix together the rub ingredients in small bowl. 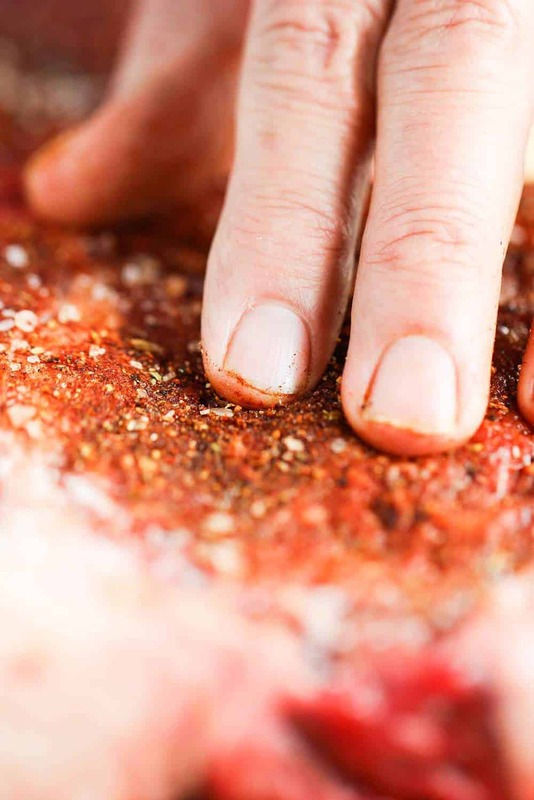 Sprinkle rub over the steaks, pressing with your fingers to adhere to the meat. Let sit for another 15 minutes. Heat grill to medium-high, direct heat. Grill steaks, about 6 minutes per side. Use an instant-read thermometer: 130°F for medium-rare and 140°F of for medium. Let steaks rest for about 5 minutes. Serve with Best Chimichurri Sauce. I don’t know what is more amazing: the gorgeous steak or the delicious sauce! This dish is so easy and perfect for special occasions or lazy weekend feast. Love the photos! 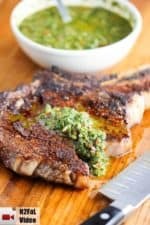 I love ribeyes… they are truly my favorite and Ive never met a chimichurri sauce I haven’t wanted to gobble up! . I cant wait to try your ancho chili rub.. that sounds so good.. looks like you took care of my Dinner plans! We love our steaks and your cowboy steak is exactly the type we’d choose. Hubby swears meat on the bone. We always pick up our pork chops on the bone too. The sauce looks and sounds amazing. It would be great to have on hand with any meat. I will pick up some chilis for the chimichurri sauce. Will be trying out your rub too. We’ve got several rub recipes and love trying new ones. Oh, boy! This is one delicious looking steak! I’ll have to make extra chimichurri sauce because I can practically eat it by the spoonful! Great steak for Father’s Day! You two are a blast to watch! Love it! I never ever ever make steak, can you believe that? I am not good at it, but I am super inspired to go make this recipe and my husband will be so happy! I love the rub and then the chimichurri sauce sounds AMAZING! My poor husband almost never gets a nice, big steak, because I never cook them! But we visited friends in Wyoming awhile back, and they served him the biggest, juiciest steak I’ve ever seen. It kind of looked like this one! 😀 This looks so easy and delicious- I should make it for him!! The marble on that steak is amazing! I’m practically drooling at my computer. I’ll have to check out the rub – I love a good kick when it comes to grilling. This will be on my BBQ once summer hits. 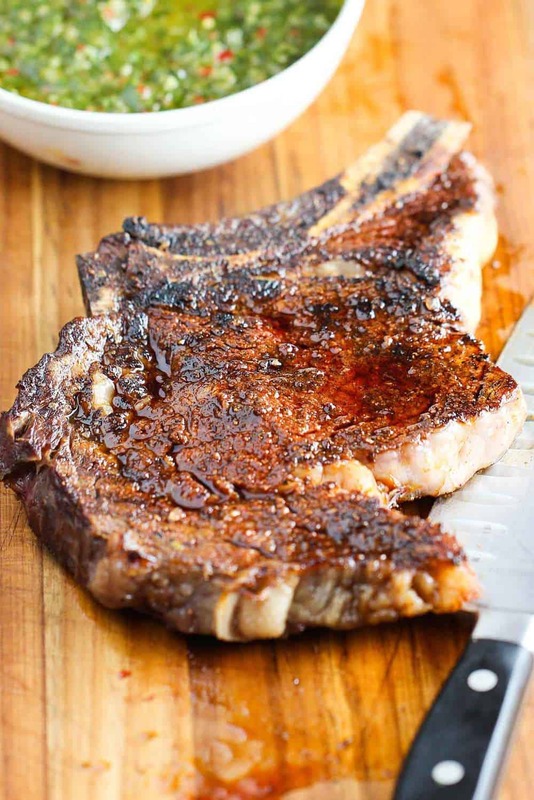 Woo hoo for grilling season…..steak…..and this delicious sauce. I love using chimichurri on lamb too. What a great recipe…..and I think it would make a great Father’s Day dinner for next weekend. Ribeye is my absolute favorite cut of steak! It definitely has the most flavor. Your pics have my mouth watering! That rub and chimichurri combo sounds fantastic, I think it will make it to my back patio this summer! Pinning now. Ribeye is my absolute favorite cut of steak! It definitely has the most flavor. Your pics have me salivating! That rub and chimichurri combo sounds fantastic, I think it will make it to my back patio this summer! Pinning now.